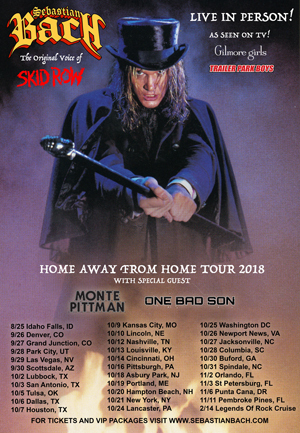 Former SKID ROW vocalist SEBASTIAN BACH has confirmed a new round of tour dates. Dubbed the "Home Away From Home Tour", the trek kicks off on August 18th in Imperial, NE and runs through November 11th, where Bach will appear at Rockfest 80's. Sebastian will also be appearing on the 2019 installment of the Rock Legends Cruise.